Amit Chatterjee is a guitarist, sitarist, vocalist and composer who combines his heritage in Hindusthani (North Indian) music with more than two decades of performing and recording different musics of the West, including European based music, progressive jazz, funk, rock and other popular forms of the art. He has recorded and performed extensively with luminaries such as Joe Zawinul (1993 - to the end of 2004), Eric Johnson, Carlos Santana, Badal Roy, Glen Velez, Paul Winter and Paul Halley, Sting, Robert Thomas Jr., Burhan Ocal and many others. 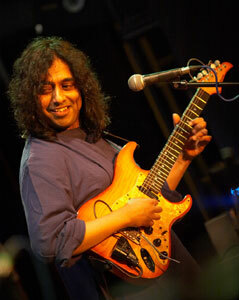 Amit was a featured artist (as guitarist and vocalist) in Joe Zawinul's primary band of the last 15 years - The Zawinul Syndicate. He was also featured as a soloist on Mr. Zawinul's symphonic work, "Stories of the Danube." He has recorded several solo albums of his own works, including four recordings of Indian Classical music on sitar. Currently, Amit has finished a collaborative duo album with the great tabla artist Badal Roy. This is the second of such duo albums, the first one having received rave reviews a few years ago. He is also presently performing his own music with his own group in Europe. Amit was a visiting professor for Ethnomusicology department at the University of Miami from 1984-1986 and continues to draw on his multicultural background as a musician and teacher. His passion has been to continue to forge a true global music, one that is not just a patchwork of sounds from different cultures, but a new music altogether which is forged in deep and sincere study of the different musics, yet which expresses unostentatiously the simple joys and sorrows of the life of the modern-day global person. He is known for being able to seamlessly flow in and between the musics of the West and India without compromising either. In recent time Amit cooperates with the percussion genius Pete Lockett (working with Peter Gabriel, Natasha Atlas, Bjork, etc.) and tabla virtuoso Fazal Qureishi (brother of tabla legend Zakir Hussain). As a studio musician he works all around Europe, America and India.